Traditionally, games devote their attention to the Hero and the details of their epic quest. We players, bloodhounds slavering for plot, fixate on this Hero. We tear into them, inhabit them, and through their agency, we exert change on an authored world. * * *Like many fantasy tabletop roleplaying games, Laura Simpson’s A Companion’s Tale  tells the story of an Epic Hero struggling against a Major Problem. In defiance of the genre, however, this hero is volatile, self-contradictory, and unpredictable. This is because no player ever controls the hero directly. Rather, the hero is refracted through the stories and memories of various side characters and NPCs that the players embody. Instead of authoring the action, players’ characters witness it, commenting on the history, culture, and geography of the make-believe world as they do so. Instead of hounds, they’re bees, gathering sensory details from an expansive land, bringing it together for the collective hive to make sense of it all. The linear juxtaposition of images forces us to assign meaning to this juxtaposition, a meaning that is greater than the sum of the individual images. While McCloud is talking about images on the page of a comic book, it isn’t hard to make the conceptual leap to images in your imagination. Because humans operate in linear time, our stories are consumed in a specific linear order. Be they spurred by the interpersonal storytelling of a tabletop RPG or the prose of a piece of interactive fiction, the linear juxtaposition of images forces us to assign meaning to this juxtaposition, a meaning that is greater than the sum of the individual images. Interactive fiction, in its various forms, can uniquely take advantage of this fact. By allowing players to determine which portions of the story to consume, interactive fiction assigns an alchemy of meaning unique to each player, informed by their choices (or perceived choices, as I mentioned in my last essay ). * * *In Failbetter Games’ text-based videogame Fallen London, players take on the role of an escaped prisoner exploring and making a name for themselves in the titular city . Unlike regular London, however, the Victorian city of Fallen London was kidnapped by bats and brought underground decades ago. Now the city is populated by devils trading in brass, socialites addicted to hallucinogenic honey, spirit traffickers looking to make an illicit buck, and all manner of peculiar denizens. While you do advance your character, gaining various forms of currency, increasing your skills, earning titles and strange artefacts, it is these denizens and the peculiar city they inhabit that form the heart of the game. Yes, you focus on your hero—though your actions are, more often than not, far from heroic—but you position yourself in relation to the setting, rather than, as in many hero stories, above or outside of it. You play through hundreds of small storylets, most arising either randomly or depending on your in-game location. You traipse through the game, picking out stories that interest you, that you wish to enter, or that you stumble upon. You are birds, plucking stories from a curious world to line your nest, your own, cozy narrative. Rather than tell a singular hero’s journey along a predefined path, the branches and detours of a piece of interactive fiction allow for a more meandering, exploratory experience. Interactive fiction offers to players a rich means of exploring a world. Rather than tell a singular hero’s journey along a predefined path, the branches and detours of a piece of interactive fiction allow for a more meandering, exploratory experience, where the setting, the side characters, and the environments take center stage. Stories are often told through their environments, after all . Not all these paths need be fully mapped. McCloud also talks about “closure” or the mind’s ability to fill in the gaps of a story, even when the eyes cannot see it . Allowing players to come to their own conclusions, to create their own links between parts of the story is its own alchemy. In order to make sense of two elements juxtaposed in a “jarring combination,” the mind must build a bridge spanning the occluded areas and be forced to create story where none is visible. Reading such a piece of interactive fiction, thus, becomes an even more creative act. With the growing ubiquity of game design tools, especially in interactive fiction, I’m heartened by the unconventional stories independent designers are telling. Rather than tales of bloodshed and conquest, we’re seeing more games that make use of these affordances that interactive fiction gives us to create stories of wonder and exploration, of learning about others worlds and other people. Hounds no longer, we metamorphose into bees, into birds, into graceful, flying things that soar to the upper atmosphere of human imagination, and then out further still. L. Simpson, A Companion’s Tale, Sweet Potato Press, 2018. S. McCloud, Understanding Comics: The Invisible Art, New York: HarperPerennial, 1994. S. Biswas, “Rituals, Cheating, and The Dream of Possibility,” sub-Q, February 2019. C. G. J. C. O. W. Alexis Kennedy, Fallen London, Failbetter Games, 2009. S. Biswas, “Videogames and Art of Spatial Storytelling,” Kill Screen, 1 March 2016. 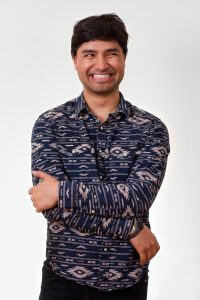 Sharang Biswas is an award-winning game designer, an internationally exhibited artist, and a published writer based in New York. He has exhibited work at numerous museums, galleries, and art fairs including the Institute of Contemporary Art in Philadelphia, Pioneer Works in Brooklyn, and the Toronto Reference Library. He has designed curricula for the Museum of the Moving Image, created learning games for the Metropolitan Museum of Art, and written about games, interactivity, and culture for publications including Kill Screen, Sub Q, ZAM and First-Person Scholar. His two food-based games, “Feast” and “Verdure”, have garnered numerous accolades, including an IndieCade Award and and IGDN Indie Groundbreaker Award. Sharang has lectured or taught courses on game design at various universities and cultural institutions including Dartmouth, Columbia Teacher’s College, New York University, The International Center of Photography, and the Museum of the Moving Image, as well as spoken at conferences such as Game Devs of Color, GaymerX, Living Games, IndieCade and Boston FIG Talks. Sharang holds a bachelor’s in Biotechnology and Biochemical Engineering from Dartmouth College and a master’s in Interactive Design from Tisch School of the Arts at New York University. He is the Experience Designer for The Medici Group, a consulting firm focusing on diversity and innovation.